With the deadline looming to implement new Accounting Standard, Revenue from Contracts with Customers (ASC 606), many organizations are hard at work to redefine how revenue is recognized for products/services sold and how contracts are established with customers. The new standard lays out five overarching steps that companies, both public and private, must address. (See more details and timelines below). And while these steps provide a general framework to guide implementation, scratch the surface and you’re likely to find many of the same nuances, challenges and complexities that I’ve found while helping organizations through the process of rethinking revenue recognition and updating their financial reporting and accounting function. In this blog, I’ll share key findings and takeaways that every finance leader should be aware of. Some of these discoveries are specific, actionable ways you can streamline your ASC 606 implementation from an accounting perspective, while others are high-level considerations on how to shift decades’ worth of thinking around the application of entirely new and different accounting principles. So beyond those five steps, what does implementation really look like? While it may vary across different industries and different organization, the following observations and “additional” requirements are ones that will most likely apply to a broad range of companies. The need for updated revenue documentation. Before anything, consider this first bit of advice: Don’t move forward without knowing where you’ve been. Do you have your current revenue recognition policies and practices under the existing standard well-documented at a detailed level? If not, do so now. You’ll need this as a foundation for your analysis – and making sure this is done upfront will save you considerable time and unanswered questions down the road. New points of estimation. As compared to the current standard, ACS 606 will require more estimation that, until now, has not been required. This can pose a challenge to past thinking, as your company will be required to estimate certain variable elements that under current practices are recorded when known, impacting factors such as the timing of revenue recognition. For example, when are revenues based on customer reporting of end user sell through recorded in revenue? You will need to challenge past assumptions of what can and cannot be estimated and there is more specific guidance under the new rule here than in the past. Introduction of entirely new core terms and concepts. In defining your contracts’ performance obligations, the new standard will require you to rethink many previously defined ways in which your company has characterized its business activities for accounting purposes. Along with this shift in traditional thinking comes new concepts – and new terms — that may take some getting used to. For example, in Step 2 the standard introduces two new terms: “stand-ready performance obligations” and a “series of distinct goods or services.” The applicability of these terms to your business is new — and as key drivers of certain policy decisions under the standard, they require real consideration. Different concepts are likely to challenge historically accepted characterizations of the nature of the company’s goods and/or services, requiring finance leaders to “retrofit” and apply new ideas to existing operations. A shift in thinking about revenue from a policy perspective at the contract level. To best explain this point, consider the naming conventions of both the old and new standard. The old standard, called ASC 605 Revenue Recognition, is now modified to ASC 606 Revenue from Contracts with Customers. This name change alone highlights the new expectation in how companies should approach revenue: as an aggregation of every contract, every performance obligation, with every customer. For companies with a high volume of customer transactions, approaching this from a practical standpoint may be particularly challenging. For example, how do you streamline the process of taking each contract through the five steps? Should you break down your contracts into groups, then analyze revenue from the bottom-up? Adding to the challenge is that for all the questions that arise, there is no real precedent to guide your thinking. The main takeaway is this: be sure you account for the time, attention and level of analysis that this review process may require. A big-picture approach to performance obligations. In looking at the five steps, the identification of performance obligations is technically something that happens in Step 2. However, I can’t stress enough the need to approach this “step” in a more holistic way. This will require an in-depth analysis of each of the alternatives provided in the standard’s implementation examples, particularly when performance obligations apply to contracts containing multiple deliverables. Here’s my best advice: once making your initial determination in Step 2, try taking your analysis all the way through Step 5 before fully committing and documenting it. In other words, ask yourself: Do Steps 3, 4 and 5 validate my thinking in Step 2? In many cases, the later steps and examples are integral to ensuring you have selected the right model under Step 2. It also helps ensure that, based on your selection in Step 2, you have a recognition model that works for your business. For instance, a stand-ready performance obligation will likely result in revenue recognized over time in Step 5, which may (or may not) make sense for your business. A refreshed analysis for certain industries. U.S. companies who have historically followed an industry-based model may be accustomed to one overarching revenue standard that, in most cases, has been more prescriptive and custom-tailored to industry norms and practices. Those companies may need to take a step back and evaluate how the application of the new standard, which applies across all industries, will require a refreshed analysis. Let’s take the example of an entertainment company who is engaged in selling licenses for its intellectual property (IP). The new standard makes a new distinction between functional IP (recognized at a point in time) and symbolic IP (recognized over time), requiring organizations to apply new concepts (and terminology) to accounting practices that have been in place for years. The standard’s inclusion of new rules for costs of revenue. Under the new standard, you’ll need to think about your revenue-related costs as well. What costs are you incurring to obtain a contract? Be sure you’re analyzing your sales commissions for amounts tied to contract value. Also, what are your costs to fulfill a contract? For this, you’ll want to think about things like set-up costs and registrations. Costs that are currently expensed as incurred may need to be recognized as assets and recognized over the period of the contract as newly required under the new standard. These are just some examples of how additional factors impact revenue and will therefore need to be capitalized and amortized. Engagement on an organizational level. Revenue-generating activities are far-reaching into many areas of most companies. As your company approaches ASC 606, it’s important not to think of it as solely an accounting exercise. The standard is driving at interpreting the economic substance of your business activities. That’s why making your revenue policy determinations requires the full breadth of your organization. Your accounting team alone will likely not have the needed visibility to consider all implications of what can be significant changes. Comprehensive involvement can optimize what may be a deep impact on process, systems and resources around the company. Listen to others, ask questions — and obtain a broad base of documentation to support your conclusions so everyone will be on the same page. Although new accounting rules come along each year, the significance of revenue recognition to investors, senior management and key stakeholders should make the adoption of ASC 606 a critical strategic priority, garnering the focus of a company’s key leaders to achieve the right results. I hope that by sharing these personal perspectives, finance leaders will gain some preliminary insights to help navigate the best course of action. Above all, it’s good to be aware of the extensive amount of work that’s involved – so you’ll want to be absolutely sure you don’t wait until the last minute. Also keep in mind that 8020 Consulting can help alleviate your burden, so don’t hesitate to contact us at any time. Take the first step now. In May 2014, the Financial Accounting Standards Board (FASB) issued its new revenue recognition guidance in Accounting Standards Update (ASU) No. 2014-09, Revenue from Contracts with Customers (ASC 606). 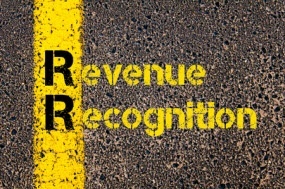 The new FASB and IASB (International Accounting Standards Board) revenue recognition guidance is nearly identical and represents a single, global revenue recognition model. The new model improves and converges the revenue recognition requirements of U.S. GAAP and International Financial Reporting Standards, and replaces both with principles based guidance. The new revenue recognition guidance is presented in ASC 606. The new standard is effective for fiscal years beginning after December 15, 2017 and 2018 for public and non-public companies, respectively. With adoption less than a year away for calendar year-end public companies, the Securities Exchange Commission (SEC) expects public companies to disclose in a detailed manner the impact that the adoption of this significant standard will have on their financial statements. 8020 Consultant Sue Chaplin is an active CPA with 15 years of finance and accounting experience in entertainment, media, technology and financial services. A former PwC Audit Senior Manager, her experience includes Paramount Pictures, Disney, CBS and State Street. Sue was the VP of Finance at Todd-Soundelux, a post-production sound leader, as well as the Director of Finance at Warner Music. Sue has applied her creative problem-solving skills across the spectrum of large, small, public and private companies. She has written industry research white papers and contributed to external publications, and she has experience in finance and accounting, SEC reporting, auditing, technical accounting, budgeting and cash forecasting, financial statement preparation and process and control enhancement. Sue holds a BS in Accounting and a BA in Economics from the University of Connecticut.